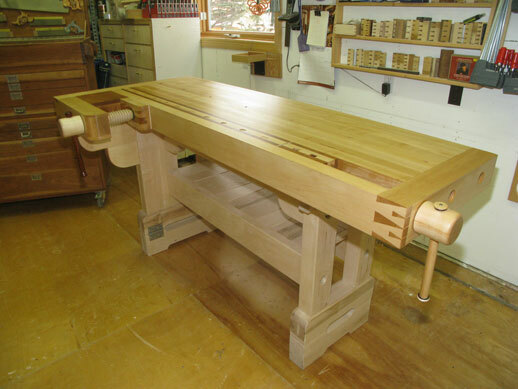 Our December 2013 Workbench of the Month comes from Duncan Robertson from Cohrane, Alberta – Canada. 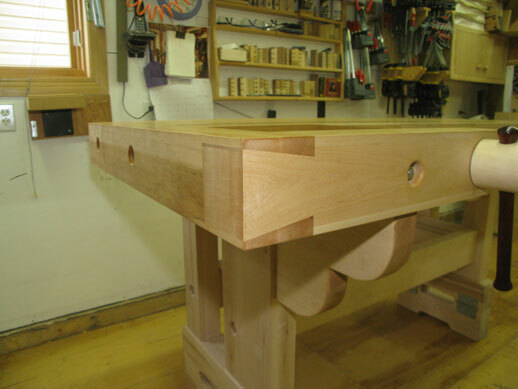 Duncan runs the School of Quiet Woodworking outside of Calgary and he actually took a some time for himself to craft his own masterpiece workbench that features both a Shoulder and Wagon Vise. We hope you enjoy this month’s feature. Very well done Duncan, very well indeed. As promised, here are the pictures of my latest bench. I have finally built a bench for myself rather than one that both my students and I use. It is 24” wide, 78” long and 5” thick all the way across. It has 2 adjustable heights. 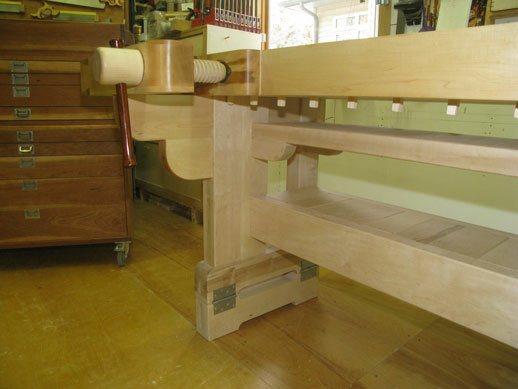 The higher one for sawing chiseling and all layout out work while the lower one is for hand plane work and some larger assembly. 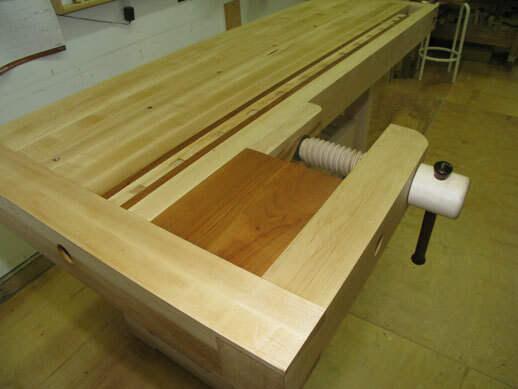 The entire bench is built out of eastern Hard maple with the accent woods being cherry and the shoulder vise handle Vietnamese Rosewood. I did the houndstooth dovetail on the wagon vise corner because I hoped it would look as good as it did. And after a great deal of work the end result was worth it. The higher of the 2 shelves is permanent home to my basic 3 hand tool accessories, bench hook, planning board and shooting board. Keeping these 3 jigs right below the working surface makes them very handy. I sized the length of the bench dogs to allow the jigs to slide in and put without hitting the dogs. As always your vise screws are a dream to use. This is the first time I have installed one of your wagon vises and the closest I can come to a complaint is that the 2 TPI is almost too aggressive. It isn’t, but it’s close. I have a class building full sized benches currently running. 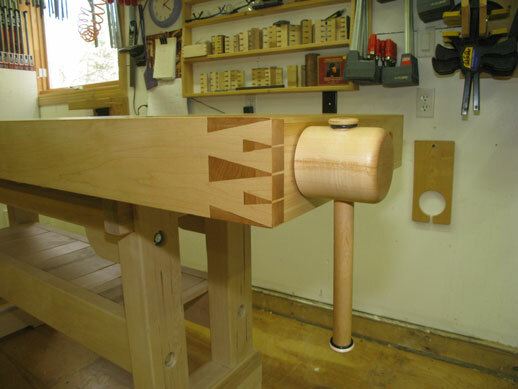 All the people in the class elected to go with your wagon vise screw. I’ll send pictures of the benches when they are finished. One guy is actually building his bench with a tool tray!!! Despite my predictions of dire consequences should he do so! The 3 benches are quite different and will make great benches and, hopefully, bring their owners many years of satisfaction. 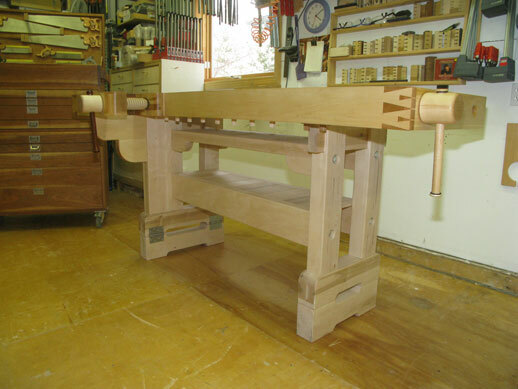 This entry was posted in Workbench of the Month by Lake Erie Toolworks. Bookmark the permalink.